Great value for money, excellent low-end extension and capable of very high volumes. Image Control Waveguide from JBL's flagship M2 Master Reference range. Dual class D amplifiers to deliver seriously high volume. JBL's patented Slip Stream low-frequency ports for accurate low-end at any volume level. Front-mounted power switch would be helpful. Not as accurate as some smaller speakers. Usually, affordable studio monitoring goes hand in hand with low-powered amps and limited frequency response. Getting hold of a speaker with a deep bass response capable of hefty volume can often mean shelling out some serious cash. JBL's LSR308 is the larger of the two monitors (we looked at the smallerLSR305s last month) in the Series 3 range and offers some serious bang for your buck. "The build is generally very good for a monitor in this price bracket"
Not only does it feature two 56 Watt class D amps but it also contains an ample 8-inch low-frequency driver. Throw in JBL's patented Slip Stream low-frequency port and you end up with some serious low-end action. The build is generally very good for a monitor in this price bracket. Although the cabinets have a slightly plastic feel to them, they do feel well made and are certainly not going to fall apart with everyday use. They have a glossy finish and are pretty good to look at. They are very large compared to most models we have in the studio. Luckily we had room but it's worth double-checking those dimensions if you are limited for space. The 308s are extremely light for a monitor of this size. At first glance I expected to put my back out installing them. Needless to say, I didn't. Before we look at the real world performance of the LSR308, let's look at the controls and connectivity. First up, everything is around the back of the cabinet, including the power switch. We would have preferred this at the front for easy access to be honest. Also on the rear you have the choice between XLR and 1/4-inch jack, both of which are balanced. There are also handy trim controls for both low and high-frequency found on the back which will allow adjustments to be made in problem spaces. An input sensitivity control and indented volume control finish off this section and should enable the user to precisely control the monitoring level and match the output when using multiple sets of speakers. We set the LSR308's up next to two other pairs of monitors, some Dynaudio BM6As and a set of Yamaha HS5s. Both of these monitors are smaller and are more limited in low-frequency reproduction. We were able to switch between all sets in real time in an acoustically controlled environment. "The first thing that struck us was the sheer depth of the low-end here"
The first thing that struck us was the sheer depth of the low-end here. The spec sheet shows that the 308s can go as deep as 37Hz. There is no doubt that this can certainly be used as a 'full range' system and we would go as far as to say that they could be run without JBL's optional powered sub. After playing a good amount of material that we're very familiar with (and continuously switching between monitors) we can safely say these sound very good. They are maybe not as accurate as smaller speakers, however - all that low-end and volume does seem to come at a cost. Although the overall sound is easy on the ear, we sensed a dip in the mids and perhaps a slight woolliness to the low-end. The Yamaha and Dynaudio models were able to reproduce both these areas with a greater degree of accuracy. The stereo image was excellent however, and the 'sweet spot' seemed very wide in comparison to the other test subjects. This may be down to the Image Control Waveguide JBL have employed. This was actually developed for their flagship M2 monitors and seems to really deliver the goods here. All in all, the LSR308s represent excellent value for money and deliver a sound that is truly larger than life. 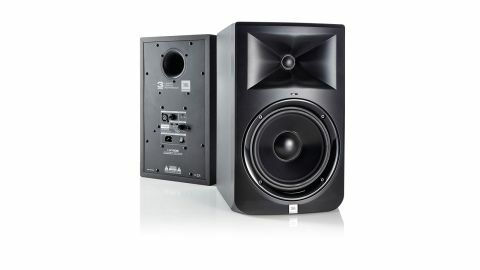 These would be ideal for someone looking for something with a good deal of low-end extension and the ability to go a little louder than other monitors.